The creation of a VSAN cluster is identical in many respects to how a vSphere administrator might create a DRS or vSphere HA cluster. A cluster object is created in the vCenter inventory, and one can either choose to enable the VSAN cluster functionality and then add in the hosts to the cluster, or add the hosts first, and then enable VSAN. When you enable the VSAN functionality on the cluster, a single option is displayed asking the administrator to choose a manual or automatic (default) cluster. This simply refers to whether the vSphere administrator would like VSAN to discover all the local empty disks on the hosts and automatically have VSAN claim them, or if they would like to manually select which disks to add to the cluster. Let’s look at the options in more detail. 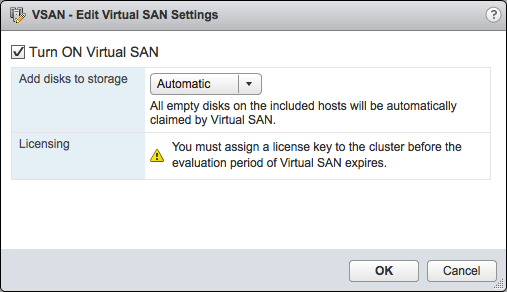 If this option is selected, the VSAN cluster is still formed. However the resulting vsanDatastore is 0 bytes in size initially. VSAN creates a single distributed datastore (vsanDatastore) using local empty HDDs from ESXi hosts added to the cluster. In manual mode, the administrator will have to manually create “disk groups” on a per host basis and add at least one HDD and at most one SSD disk to each of the disk groups. A disk group can be thought of as a storage container. As disk groups are created, the size of the vsanDatastore will grow according to the amount of HDD that is added. Note that the SSDs function as read caches and write buffers, and are not included in the capacity of the vsanDatastore. If you have multiple SSDs, then multiple disk groups will have to be manually created as there can only be a maximum of one SSD per disk group. Another important point to note is related to the scale-out of the VSAN cluster. If a new ESXi host is added to the VSAN cluster which has been set up in manual mode, the local storage from that host will not be added to the vsanDatastore automatically. The vSphere admin will once again have to manually create disk groups and add the disks to the disk group in order to use the new storage from the new ESXi host. If an automatic method is chosen to create the VSAN cluster, VSAN will automatically discover local empty HDDs and SSDs on each host & automatically build disk groups on each host in the cluster. Each host with valid storage will have a disk group containing of their local HDDs and SSDs. Since each disk group can only contain a single SSD, there may be multiple disk groups, each containing an SSD and one or more HDDs. Finally, once all of this is completed, the vsanDatastore is created, and its size reflects the capacity of all the HDDs across all the hosts in the cluster, less some metadata overhead. There may be occasions where automatic mode does not claim “local” disks. We have observed situations where hosts with SAS disk controllers have their disks show up as “remote”. In certain corner cases, VSAN may not auto-claim the disks. You will have to manually create the disk groups in this case, even though the cluster is set up in automatic mode. Maximum number of disk groups supported per node is 5. Maximum number of magnetic disks (HDDs) per disk group is 6 in the original beta. At GA, this was updated to 7 disks per disk group. Maximum number of SSDs per disk group is 1. Note that these are beta maximums and may change when VSAN becomes generally available. Always refer to the official VMware documentation on VSAN for a definitive support statement. So i have a small question. Im not entirely sure how virtual disks work into the VSAN senario. Lets say i have a ESXi server with 1 SSD (600GB) and 5 HDDs of 1TB each. How will a 2TB volume be provisioned on the disks? will it automagically make a strip since, it cannot reside on a single disk, or does it split the VMDK files in say 2 1TB files so they can fit on one disk. Stripe Width is something which one sets in the policy. If you specify a stripe width of 5, then yes, the VMDK storage object may be striped across the 5 disks. However, striping may also occur if the VMDK size is greater than the size of the local disks. So in your case, because the disks are much smaller than the desired VMDK object, there will also be striping across disks to meet the size of your VMDK. However, it may only stripe across 4 of the 5 disks, as this will allow the VMDK to be 2TB in size.